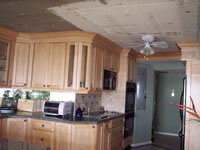 Our team of technicians performs the installation of our ceilings and walls. 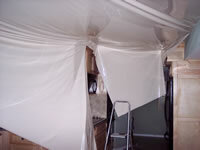 They are highly trained to achieve an absolutely perfect installation, each and every time. A wall support is used when it is necessary to leave a gap between your existing ceiling and the stretched ceiling for insulation or sound proofing, lighting installation, leveling the ceiling or any number of other reasons. A clip-in frame is attached directly to the ceiling when it is unnecessary for any gap between the existing ceiling and the stretched ceiling. With this method the gap is only 5/16 inch. 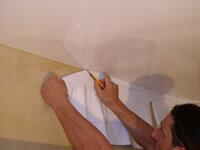 Once the frame is in place, the vinyl sheet is inserted into the clip-in system on one side of the room using a tool that resembles a spatula. The vinyl is heated, stretched and inserted into the rest of the framework. As the vinyl cools down it stretches taut, leaving you with a perfect ceiling. Any excess vinyl is cut away, leaving only 3/16 inch of the frame visible. 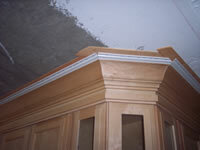 Any type of molding may be added to further enhance your ceiling. 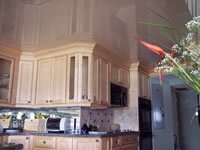 Cutouts are easily made for lighting fixtures, vents, sprinklers, speakers, etc.